1. The Artifact Workshop feature will open when your character reaches Lv.70. 2. 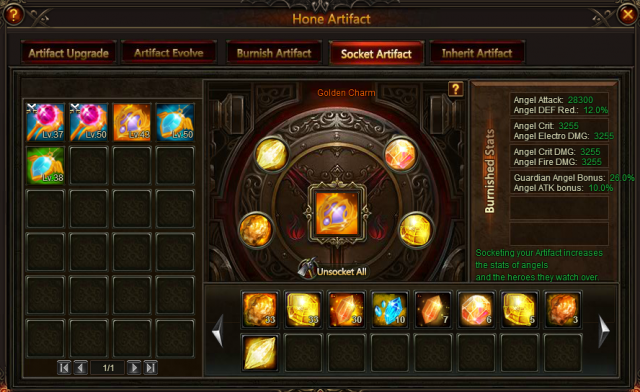 The Artifact Workshop system can be used to refine your Angel Artifacts. You can equip your angel with Artifact to get Artifact skills and to increase the Battle Rating. 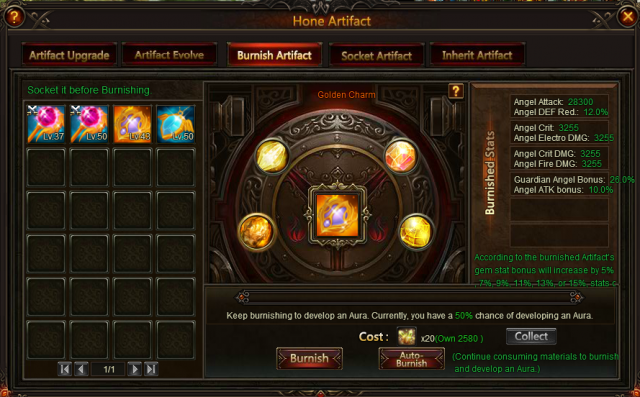 Artifact Workshop system consists of five parts, Artifact Upgrade, Artifact Evolve, Burnish Artifact, Socket Artifact, Inherit Artifact. You can use Artifact EXP Card or other Artifacts to upgrade the target Artifact. In this part, you can evolve an artifact by consuming artifact and artifact Essence. 2.Burnish upgrades sockets instead of gems. 3.According to the Aura level the Artifact gem stat bonus will increase by 5%, 7%, 9%, 11%, 13%, 15% (successful burnish required). Stats can be stacked. 6.Burnished Artifacts can not be used as Upgrade or Evolve materials. 7.Burnish may fail, but the progress will increase. Burnish will have a 100% success rate after reaching full progress. 2.Gems of the same type cannot be socketed together. 3.Socketed gems will gain an Aura after they have been burnished. 4.All gems must be removed before inheriting. 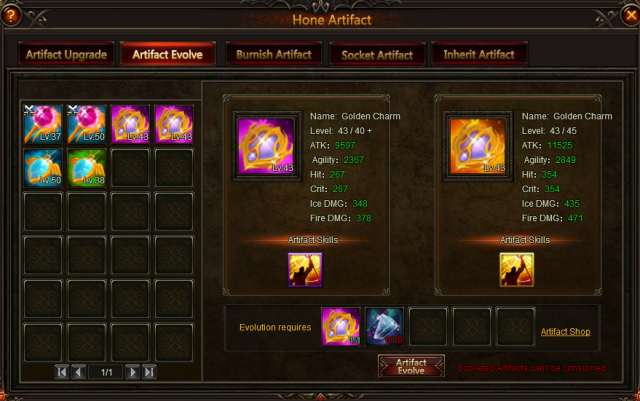 1.The original Artifact enhance level will be transformed into EXP and added to the target Artifact. 2.The original Artifact engrave level will also be transformed into EXP and added to the target Artifact. 3.Original Artifact can not transfer it’s properties to Artifacts that have a lower quality. 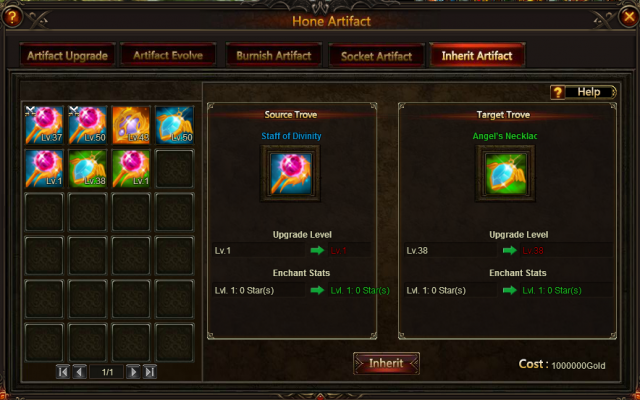 5.Inherit will switch the original Artifact and target Artifact’s burnish socket level (limited by the level cap), surplus sockets will be consumed. 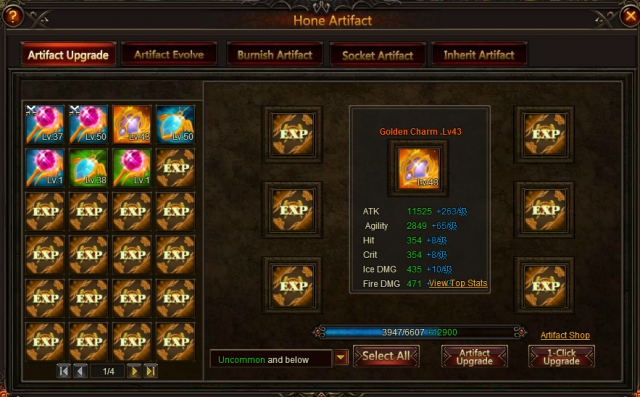 1.Equip an Angel Artifact to set Artifact skills. 2.After setting Angel Artifact skills, the selected skills will be cast within the first 4 turns in battle. 3.The same type of Angel Artifacts cannot be equipped at the same time. 4.The initial Angel Artifact skill depends on the agility of the deployed Angels in PvP battles. 5.Bonus Angel Artifact stats depend on the deployed Angels.